Organizations have an increasing number of systems, and every time they get more specialized, whether their purpose is the management of part of their business processes, or for the characteristics and needs of different subsidiaries, plants, etc., for the processes of acquisition or merger of companies or to integrate with third parties. In order for this diversity of systems not to represent a problem for organizations, it is required that these systems exchange and share information among themselves. Proper management of master or reference data. Connect or integrate applications so that business processes are not interrupted or require the manual transfer of information. Exchange information with third parties: suppliers, customers or other collaborators. Very disparate data update frequencies, from real-time integrations to monthly updates. Integrations based on time or event-driven scheduling. The data is compulsory or not depending on the system. Systems that are able to go looking for information or that can only receive it. And, therefore, the problem lies in the fact that these systems speak different languages and require an interpreter to make this communication possible. Until relatively recently, some organizations resorted to EAI (Enterprise Application Integration) or similar platforms, and others to the development of ETL (Extraction, Transformation and Load) processes for integrations between a few systems. In the first case, it required a high acquisition cost given that the integration was mainly based on native connectors, and in the second case, as the number of systems increased, its maintenance, operation and evolution became unmanageable and unsustainable. 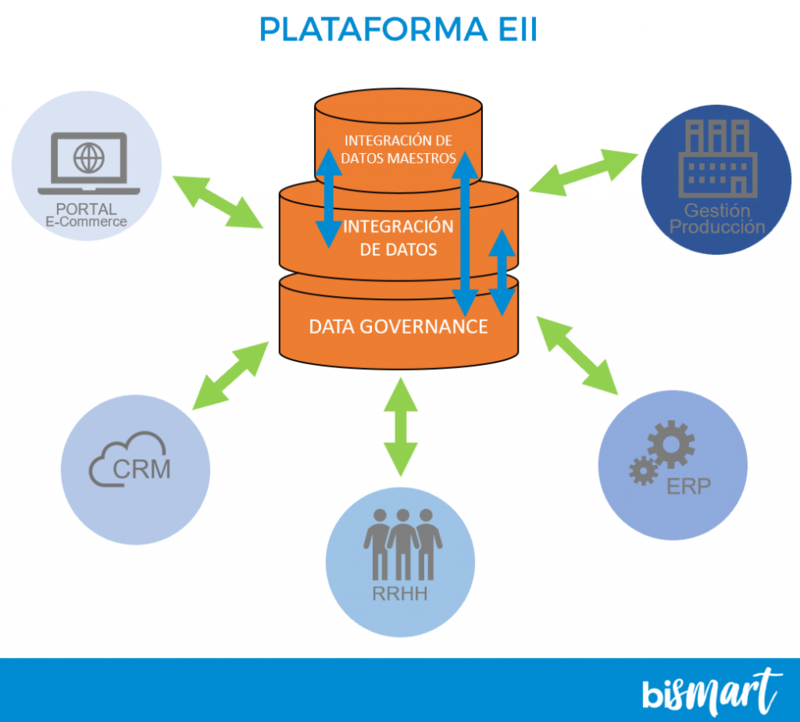 Our experience in ETL processes, data quality processes, master data management, data governance, etc., acquired in numerous DataWarehouse projects allows us to successfully solve the challenges posed by interoperability among systems in companies in different industries: industrial, leisure and transport, among others. Thanks to the technologies provided by Microsoft SQL Server Enterprise (Master Data Services, Data Quality Services, Integration Services, Power BI…), the experience, methodology and solutions provided by Bismart, it is easier to find a suitable solution for the vast majority of organizations. 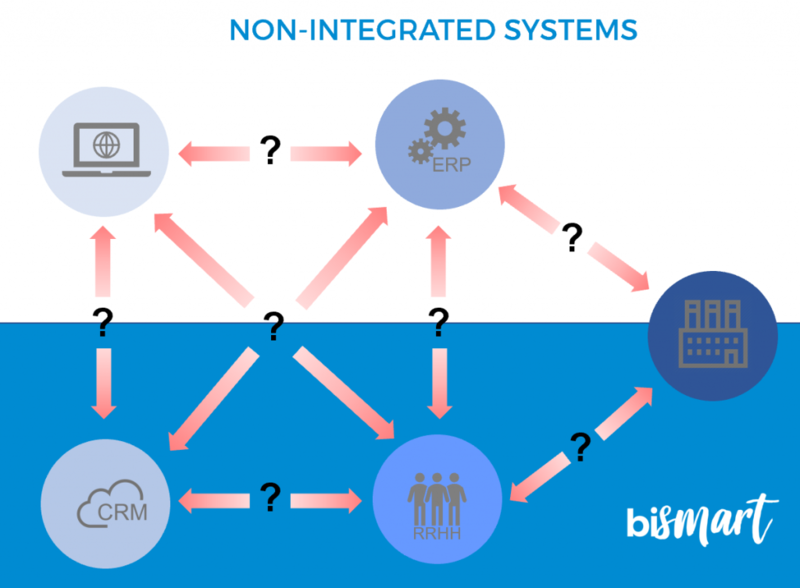 Integration of data between systems: It governs and performs the transfer of data between the systems that intervene in the business processes, ensuring the integrity of the information. Master data management: Consolidation and standardization of master data in a single system for use by different systems. Data Governance: Management of the entire information lifecycle based on a metadata architecture and powerful Balanced Scorecards. Reduces the number of integrations required. Ensures data and database standardization and information integrity. Simplifies the management and reuse of master data or other reference information. Absolute control over integration processes on a single platform. 100% self-documented based on metadata.